I know these Korean beef tacos are definitely un-Thanksgiving but the truth is I still have a family to feed and my kids would prefer to not eat Thanksgiving related dishes now AND next week (though they would make an exception for mashed potatoes and some cheddar-dill puffs). So, we’re making tacos today. 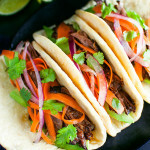 I love tacos in almost any form and I especially love these because the beef gets cooked in a slow cooker. Slow cooker meals on a busy day saves your sanity. Just prep it in the morning and let it cook all day.Then you’re rewarded with some meltingly tender meat that’s a little smoky, a little sweet, and a lot tasty. Add some tangy carrot and red onion slaw to balance the sweetness of the beef and some avocados because they make everything taste better, then drizzle with a little or (a lot) of the braising liquid and you’re in taco heaven. When I served these for the first time to a friend of mine, we each took a bite of our tacos and simultaneously smiled and sighed with utter satisfaction. The recipe calls for using a chuck roast and tying it with string before cooking. Tying the roast helps keep it together and makes it easier to handle once it’s done cooking and becomes really tender. I prefer using the classic-tie method for tying roasts which uses one long piece of string rather than other methods that use several pieces of string. If you’ve never tied a roast, you can watch this video on the Epicurious website that demonstrates the classic-tie method. It’s a handy technique to know. I’m hosting Thanksgiving dinner next week so I’m spending the weekend researching recipes, taking requests, and planning the menu. It’s what I live for! I hope you get to do something you love this weekend too. In a medium bowl, mix garlic, ginger, brown sugar, soy sauce, rice vinegar, and sesame oil together until sugar is dissolved. Set aside. Heat 2 tablespoons of canola oil in a large heavy skillet over high heat. Add tied roast to the pan and sear on all sides. Add more oil as needed. Place roast in a slow cooker and pour soy sauce mixture over the roast. Cover and cook on low heat until meat is very tender, 6 to 8 hours. Transfer the roast to a serving platter and tent with foil to keep warm. Strain the cooking liquid through a fine mesh strainer into a small saucepan. Skim fat off the top of the sauce. Simmer the sauce over medium-high heat until reduced by one quarter to one half, 15-20 minutes. Meanwhile, remove cooking twine from the roast and shred the meat. Pour some of the heated sauce over the meat. Use just enough sauce to moisten the meat. Reserve the remaining sauce for serving. In a medium bowl, mix together the rice vinegar, sugar, and salt. Add the sliced onions to the mixture and let sit for 5-10 minutes. Add carrot ribbons and cilantro; toss to combine. Make tacos by layering desired amounts of sliced avocados, shredded beef, carrot slaw, and cilantro leaves in warm tortillas. Drizzle with reserved sauce and a squeeze of lime, roll up, and serve. To make carrot ribbons, first peel carrots and then run a vegetable peeler lengthwise down carrot sides to create long, thin ribbons. Cut ribbons to desired lengths. Recipe adapted from Carpe Season. Slow cooked beef was all smooth taste and nothing chewy. I found cilantro a nicely penetrating flavor and found “more was better”. Liking a more burrito-ism sized wrap to hold the good stuff, I used larger flour tortillas in place of corn or flour taco shells. Thanks, Ken. I’m so glad you liked this recipe.